These days, most of us have heard of the word ‘autism’, whether it’s in the news, online or on TV. But despite that growing recognition, there’s still a gap in people’s understanding of the condition – and the challenges that come for both individuals who are ‘on the spectrum’ and their families, friends and loved ones. That’s where Stirling Autism Research, at the University of Stirling, is making a difference. Their vital work with children and adults with autism is helping to educate, inform and break down barriers. And collaboration is at its heart, with a range of experts and volunteers coming together to really drive things forward. Now, at Sharp Apps, we’re proud to be playing our part too. 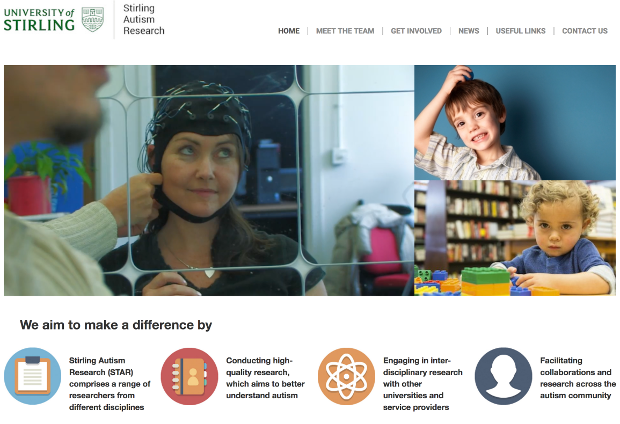 We’ve just completed a new website for Stirling Autism Research, providing an online HQ to help raise their profile, get people involved and spread the word about the both the condition and the important research being done to better understand it. Here’s hoping our efforts will help this project get the attention it deserves – so take a look and feel free to share it with anyone you think may be interested.